working, and others were working and running at double speed. We shut down everything electrical and called the power company. It turned out that a passing truck had snagged a low-hanging telephone line, which had recoiled and dislodged the power cable that ran from the transformer to our home. This shorted itself out, and put a surge of 220 volts through our system, blowing some circuits and causing others to operate at double power. It didn’t take long to fix. A few appliances were damaged and needed to be replaced, but we are insured for that. My main concern was that our computers — including the one I use to produce this magazine — might not work. Had they been zapped into oblivion? No, they had not. The vital components containing the data had been protected because the surge protectors had done their job. 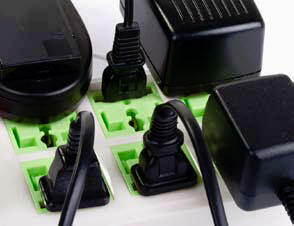 connect between a power outlet and electronic equipment. why our homes are equipped with circuit breakers or fuse boxes. But a power surge usually lasts just a few billionths of a second, faster than most breakers can react. If not checked, it will rip through delicate electronic circuits like a tsunami. Those few billionths of a second can cause hundreds of hours of lost work and thousands of dollars of expense. up in smoke. If you don’t have a surge protector, may I suggest you get one? And while we are on the subject, what about urge protection? these temptation – creating situations — life is full of unexpected situation-induced urges to cheat, to steal, to covet, to lust — let’s call them what they are — urges to sin. The Bible calls this temptation, but the temptation, of itself, is not sin. The letter of James makes that clear: “When tempted, no one should say, ‘God is tempting me.’ For God cannot be tempted by evil, nor does he tempt anyone; but each one is tempted when, by his own evil desire, he is dragged away and enticed” (James 1:13-14). Paul, a man who took his spiritual health very seriously, was forced to admit that he was “sold as a slave to sin” (Romans 7:14). “I know that nothing good lives in me, that is, in my sinful nature. For I have the desire to do what is good, but I cannot carry it out. For what I do is not the good I want to do; no, the evil I do not want to do — this I keep on doing. Now if I do what I do not want to do, it is no longer I who do it, but it is sin living in me that does it” (Romans 7:18-20). care of that. But there are the secondary consequences to the sudden urges to sin. “A man reaps what he sows,” Paul wrote in Galatians 5:7. Proverbs 6:27 puts it like this: “Can a man scoop fire into his lap without his clothes being burned?” That flash of anger, the moment of lust, a sudden outbreak of envy or pride—these can produce effects that last a lifetime, and even beyond. permanent place in the family, but a son belongs to it forever” (John 8:34-36). As brothers and sisters of Jesus, we belong to God’s family. And we are not alone. “I will not leave you as orphans; I will come to you…. The Counselor, the Holy Spirit, whom the Father will send in my name, will teach you all things and will remind you of everything I have said to you” (John 14:18, 26). suddenly surges into our lives. “But when he, the Spirit of truth, comes, he will guide you into all truth” (John 16:13). A heart guided by the Holy Spirit is insulated by the fruit of the Spirit — love, joy, peace, patience, kindness, goodness, faithfulness, gentleness and self-control. Each of these offer protection, providing a safe alternative path to potentially destructive waves of temptation. But the Spirit guides — he does not demand or insist, any more than a surge protector will plug itself in. Whether to listen to his prompting, whether to follow his lead, is your decision. We are free to simply let temptation have its way with us, and sadly, we often give in. blossom into sin. Scientists who have studied our brain’s neural networks tell us that the speed of thought is less than that of electricity. So we may have a bit more than a few billionths of a second. Whatever it is, it is long enough for us to be able to hear God remind us, “That is not the way we do things in this family.” And to let those urge protectors do their job.